Ipe Aftercare Kit – Clean with Brightener as shown in our website video to repare timber for Penofin Verde OR clean wood with mild dish soap and water. Apply Penofin Verde paying close attention to following all of the directions on the can. Wipe any excess of with smooth rag. For best result once wood is completely dry, apply a second coat. Wipe off excess second time. WOOD SHIELD is highly recommended as final step. The light, clear solution operates to protect the tabletop and seating arms from water and food stains. After the above, you will only need to apply Penofin Verde on clean surfaces as needed. OPTIONAL- WOOD CLEANER- This product can be purchased for deeper cleaning issues in lieu of Brightener or mild dish soap. All wood is a natural material subject to changes in the environment. The look and feel of natural wood is part of the appeal of owning wood garden furniture. Although Ipe is naturally stable, small checks in the wood surface may appear if the furniture is placed in dry or sunny environments. Superficial checking in no way affects the structural integrity and longevity of your furniture. 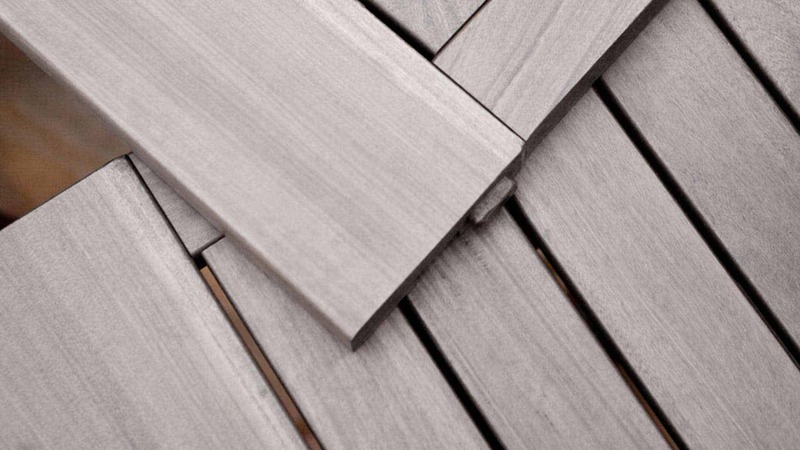 In full sun, Ipe will naturally- weather to a silver gray. ROBLE is an extremely stable timber, small checks in the wood surface may appear if the furniture is placed in dry or sunny environments. WOOD CLEANER – If you have allowed your furniture to completely dry out, or if the wood surfaces have become stained and dirty, Wood Cleaner is recommended. After application according to instructions, rinse thoroughly and allow to completely dry. ARGENTO COLLECTION – ARGENTO AFTERCARE can be purchased and already contains Wood Shield in the formula to protect the surfaces. Be sure to shake the Aftercare bottle well before applying. Apply thin coat and let dry completely (approximately 30 minutes), following the instructions on the bottle. Apply second coat. Once dry, apply Wood Shield. For repairing Argento furniture with scratches or transport rub marks (exposing the natural Roble underneath finish), we recommend ARGENTO TOUCH-UP KIT. Detailed instructions must be followed. Apply lukewarm water and mild, non-foaming soap with soft cloth or Brush the furniture clean with soft pad and rinse furniture with clean water. Cleaning recommended at least once a year. If fabric heavily soiled add 1c bleach. Wash and allow fabric to AIR DRY. Place solution in spray bottle. Spray entire surface and allow to soak 15 minutes.